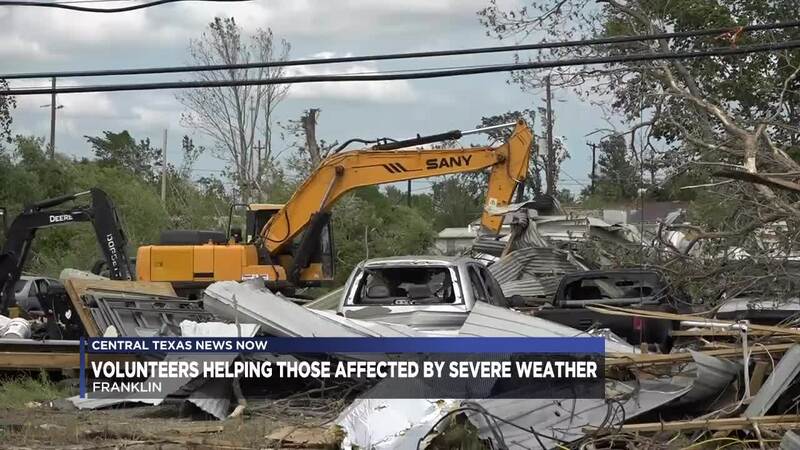 FRANKLIN, TX — The Franklin community is still cleaning up debris after the EF-3 tornado struck their town and it's surround areas on Saturday. Now with severe weather on the horizon Wednesday night, the community is being supported by many Central Texans from miles away. Bill Johnson, a survivor of the 1953 Waco Tornado, explained how he understands the trauma a storm can create. "1953...We heard the radio, there wasn't gonna be a tornado...and here it come", Johnson said remembering that faithful day. He now seeks to give those affected comfort, in the best way he can. "We heard about this and so we got our guys down here and we're working and helping people, and that's what America is about," Johnson said. Johnson, now owner of Johnson Roofing, brought his entire crew to Franklin to cover the roofs for those who no longer have a stable structure. More than 60 volunteers came to Franklin's aid, including two roofing companies, all in hopes to make Wednesday's storm safer for the community as a whole.